Whilst driving around Pattaya, it is easy to be distracted by everything that is happening all around or, perhaps, the motorbike that that appears desperate to reach their destination. I have driven along Soi 7 many times without noticing that just beyond the tree line was housing facility for families who have nothing. Khun Toy of the Human Help Network accompanied Nigel and myself along to slum No. 7 and, when looking around, we were saddened, through no fault of their own, at the conditions in which they live. But, having said that, there were warm, welcoming smiles on everybody’s face to greet us. Just one of the houses on site. 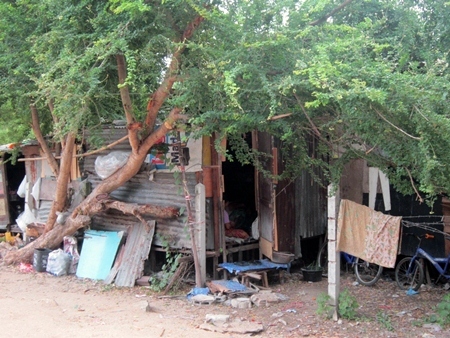 Many were living in shacks built of odd bits of tarpaulin, corrugated iron or wood that they had found lying around, hardly any TV’s, fans or any electrical items. The Fountain of Life, Hand To Hand and others help some of the families by having the children, not yet of school age, in a pre-school kindergarten to allow the parents to work and earn whatever they can to help with the everyday expenses, but additional help is always needed. In true Thai style, always smiling. May is the time of year that families have to dig deep into their pockets to provide everything that a child needs to attend school which amounts to thousands of baht for each child in the family and, according to reports, prices have increased by anything up to 10% this year. 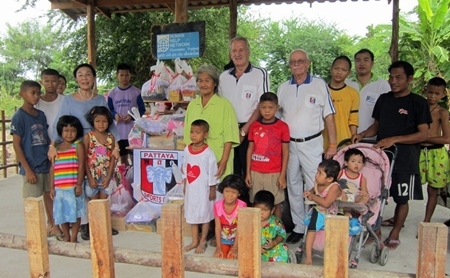 Pattaya Sports Club was there at the invitation of Toy for she had made a request for us to provide funds to purchase school uniforms, which are compulsory in Thailand, which we were happy to do much to the delight of the children. There were some funds left over and the remainder was spent on providing the children with special treats which included biscuits, sweets, fortified milk and some trainers to avoid them running around in bare feet with the obvious danger of treading on something sharp. We were made very welcome and everyone crowded around to see the uniforms being given to those over the age of 5. 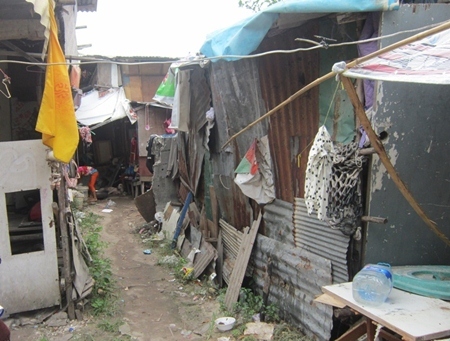 It is sad to see the conditions under which these families live, not only in this slum but all the others around Pattaya, so if you feel that you would like to make a donation, regardless how small, please contact William on 0861522754. Various goodies were given to the children. 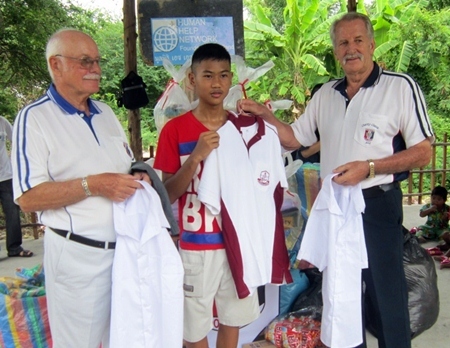 The older children receive their uniforms. Children of all ages live here.